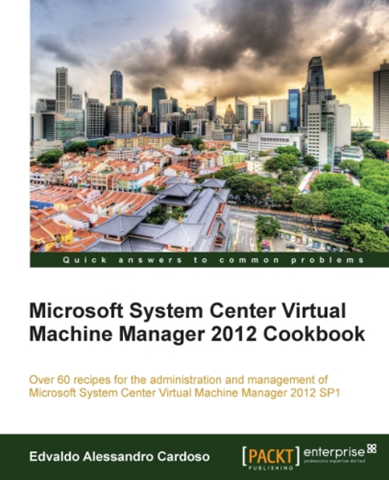 I have just finished reading Edvaldo’s book on VMM 2012 which was recently released by PacktPub. I recommend this book very much for anybody looking for a quick and efficient guide to managed virtualization! Chapter 1 focuses on architectural aspects of virtual infrastructures and on establishing a common understanding of the subject. Chapter 2 and 3 guide you through the process of installing stand-alone and highly available VMM management servers. After configuring the fabric, which is explained in chapter 4, chapter 5 covers the deployment of VM and services. The remaining chapters cover special aspects of VMM, such as upgrading from VMM 2008 R2, scripting, managing VMware and Citrix XenServer hosts, as well as managing hybrid cloud environments. I can very much recommend this book to everybody looking for a quick and comprehensive guide to mastering the management of virtual infrastructures with Virtual Machine Manager 2012. The book is available from the Packt website (http://bit.ly/Xzse12) and Amazon.